Lots of personal attention. A maximum of 50 campers per session means we get to know you. By name. Our activity offerings are designed daily, based on the interests and needs of each camper. Character building. Deer Crossing campers are well adjusted youth who thrive on challenge. One of those challenges is leadership and campers learn that true leaders first learn to lead themselves. Our program is designed to promote character traits associated with leadership: positive attitude, empathy, courage, persistence, and responsibility. Instructional depth. Using a time-tested system of reinforcing feedback and working with multiple learning styles, Deer Crossing instructors bring out the best in campers. A camper can start, never having seen a windsurfer, and progress to full lake hot-dogging racer. This goes for climbing, sailing, kayaking, canoeing … The depth of instruction allows campers to return year after year and progress in their chosen skills. Real wilderness. 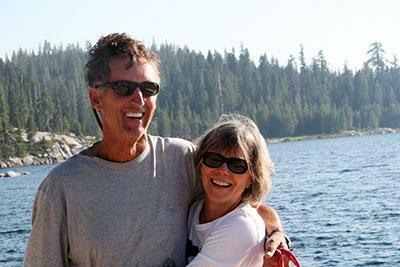 Deer Crossing is the only lodge-based, roadless, wilderness summer camp in California. The camp is only accessible by boat or a 45-minute hike from the nearest trailhead. We enjoy a lake at our front door, peaks rising to over 9,000 feet at the back door, and 100 square miles of national forest around us. Family. Deer Crossing is a second family for many campers. Those who first come for two weeks find themselves returning year after year. Lifetime friendships are made. Many of our instructors are former campers. Even when campers grow into adults and start their own careers, they often return to Deer Crossing to visit and recharge their great memories. Deer Crossing Camp is owned and operated by Jim Wiltens, who has directed camp since its beginning, and Ellen McNeil, who runs camp’s Bay Area office. Deer Crossing was founded in 1983 by Jim, his mother Gwen (who ran the camp office for 30 years), and his siblings, Roy and Diane. Camp’s original mission—to help children build resilience and independence while having fun and learning new skills in an outdoor environment—still drives camp today. Jim has written several articles that reflect camp’s philosophy. Since 1985, Deer Crossing has been accredited by the American Camp Association (ACA). We adhere to a rigorous set of standards that covers virtually everything we do before, during, and after camp. ACA standards range from staff hiring and supervision to lifeguard training, from bus transportation to kitchen cleanliness, and from backpacking safety to parent communications. Deer Crossing has attracted campers and staff from around the world since 1983. We’re proud to offer an experience where so many different talents come together each summer. We foster an atmosphere that encourages leadership qualities in all campers, starting with techniques for leading themselves. 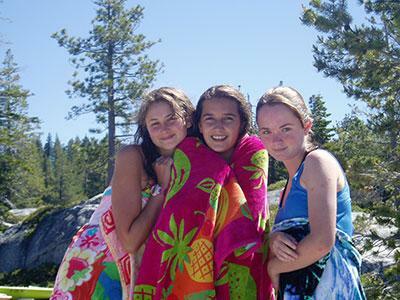 Many campers enter camp’s Counselor-in-Training (CIT) and Leader-in-Training (LIT) courses, which offer more focused and intensive practice of leadership skills. Authorized under a Special Use Permit with the Eldorado National Forest.